Now that everyone's done with discussingMichelle Obama's Election Day dress choice (who knew Narciso could be so divisive? 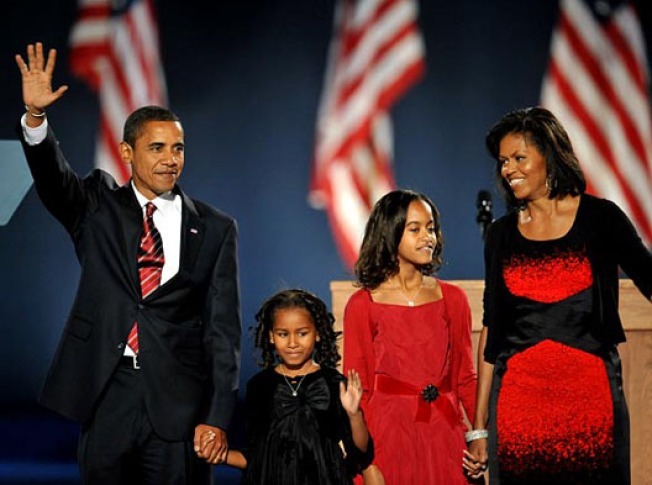 ), blogs have moved on to obsessing over what the President Elect's young daughters were wearing on the big day. The Wall Street Journal's fashion blog, Heard on the Runway, has nailed down who designed Sasha and Malia's frocks. Sasha was wearing a $72 black babydoll dress by Gerson & Gerson and Malia was wearing a $110 red bubble-hemmed silk taffeta dress made by high-end kid's brand Biscotti Inc.
MORE ON RACKED NY "The companies that make the dresses are already trying to make the most of the publicity..."